If your business structure features a flat roof, you may think that flat means an even plane. Imagine your surprise to survey the rooftop for possible damage after a storm only to be greeted with an assortment of puddles. That means your flat commercial roof has low spots. 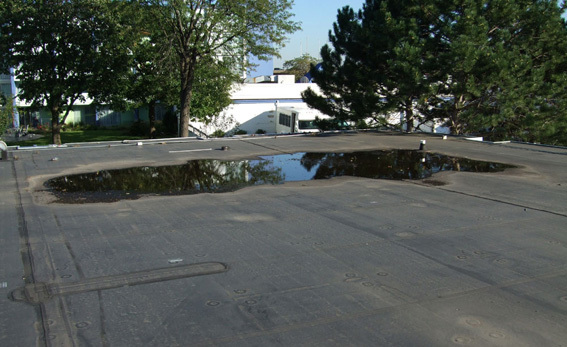 To fix a rooftop ponding problem, you need to know how to measure a low spot. You may think that a few puddles are no big deal, especially if your flat roof has been treated with a water-resistant membrane. However, the combination of time and water will take a toll. The pools of water will act like a prism, magnifying the effects of UV degradation caused by sunlight. Sun damage is not the only environmental factor to consider. Those ponds can become prime breeding grounds for disease-carrying mosquitoes. Low spots can occur for a number of reasons. Tramping about on the rooftop could have resulted in crushing underlying insulation. Puddles may outline a direct path of a heavy-footed rooftop surveyor or repairman. Structural issues, such as settling, can also cause deformities that result in low spots. It is also common for rooftop equipment like HVAC units or skylights to cause low areas. Regardless of cause, the low spot must be fixed to prevent further compromise of a roof’s integrity. Any repair begins with knowing the surface area and depth that needs to be addressed. To build up the low spot you need to determine how deep it is and the square footage of the area requiring coverage. Quality products like RoofSlope create a water-resistant membrane layer about 1/4″ thick with a coverage area of 30 square feet with each 50 pound bag of material. Use a measuring device, such as a ruler, yardstick or tape measure, to measure the pond of water at it greatest depth, usually the center. Although the puddle will not be square, measure the length and width of the sides of a square that would contain the pond. Multiply those measurement numbers together to calculate total square footage. If you opt for the RoofSlope option, repairing a low spot is as simple as applying layers of rubberized membrane to the area. Every 1/4″ of depth is a layer. For every 30 square feet of a 1/4″ layer, a single 50 pound bag of RoofSlope batch mix is needed. The product then need only be mixed with the right amount of water and applied layer by layer. Finish the job with an application of aggregate. For every 3-4 bags of batch mix used, expect to need one bag of aggregate. Broadcasting is easy and creates the perfect texture for the final finish. There is more to repairing a pond problem on a flat roof than dabbing on a few layers of rubberized membrane. The patch will need to be applied in such a way that it maintains the even plane of your flat roof. To achieve this you will need a screed board. This is a tool used by brick layers and concrete finishers. To have a nice, even line of bricks you must start with an even surface. The same principle applies to creating a patch on a flat roof. From the flat surface created by the screed, the patch can then be sloped to divert rainfall toward the roof’s drainage system. A screed will have guides that can be adjusted to create a flat surface or accommodate the creation of a sloped surface. This is a very important tool, necessary to create the perfect patch. Don’t patch your pond with just any product. Trust professional grade, proven products. Protecting your property investment should be your priority. For more information on the best water-resistant self leveling roof compound, please contact us.